Tomorrow, Duke will meet Miami in Cameron Indoor for the first time this season. We got to speak with a few guys at Category 6, a site dedicated to Hurricanes athletics, to get a better idea of what to expect from the U. We answered a few of their questions as well – you can check them out here. Crazie-Talk: What’s different about this year’s Miami squad – as compared to last year? Category 6: First off there are new players. Most notable is Kenny Kadji, who has at times played like an all conference player. He’s 6’11 and athletic, and can even step out and hit the three. Trey McKinney Jones is a solid G/F who can knock down jumpers, defend and pass. And finally Shane Larkin is the “true” point guard Miami has not had in some time. His presence allows Durand Scott and Malcolm Grant to play off the ball and focus more on scoring. The biggest difference however, is the coaching. Coach Larranaga seems to keep his players in it better then Coach Haith did. While we wish Coach Haith luck at Mizzou his tenure was marked by the ‘Canes inability to close out close games. As far as X’s and O’s Miami has changed primarily zone to man-to-man on defense this year, with occasional “scramble” (half court traps) mixed in. CT: What do the Hurricanes do best? Where do they struggle the most? Category 6: The ‘Canes are at their best when they play balanced offensively. They have a number of guys (most notably Scott, Grant, Kadji, Reggie Johnson, and McKinney-Jones) who can score in double figures. They struggle at times rebounding (even since Johnson’s return) and for whatever reason they have let a number of players have monster games against them individually by not closing out on long-distance shooters. Fortunately, the ‘Canes have improved on that area of the game during their recent run. Still, Duke has the ability to hit the 3 in bunches, so Miami will have to be aggressive and active to have a chance to keep the game close. CT: Malcolm Grant and Durant Scott lead the team in scoring at around 13 points per game. Other than those two, who should Duke worry about the most? Category 6: Kenny Kadji is more then capable of going for 20. As mentioned he is an athletic 6’11 250 pound forward/center who can score in the post, face up and drive, or nail threes. If Kadji gets going hes very very hard to defend. What’s scariest is he seems to be improving as the season progresses in all aspects of his game. (he sat out the last two seasons with injuries and having transferred from UF). Beside Kadji, Shane Larkin is capable of having a big game on both ends of the floor. Larkin has had some freshman moments but he is a blur taking it to the hoop or picking pockets. Additionally Austin Rivers and Larkin were high school rivals, so he may be extra fired up to face his old adversary. CT: How has Larranaga done in his first year? Was he an upgrade over Haith? How do you feel about Haith’s immediate success at Missouri? Category 6: I think almost all UM fans are thrilled with Coach L. In fact the athletic department extended his contract through 2019. We do feel he is an upgrade. The team seems a bit more organized. Turnovers are down. Miami has been handicapped with suspensions, and injuries since the summer. Larranaga has done an incredible job weathering it all and keeping the ‘Canes focused. Coach Haith is a total class act, so we wish him the best. We did not agree with everything he did basketball-wise at UM, but he recruited well and left Coach L a lot of talent to work with. He also inherited a ton of talent at Missouri which may explain some of his success. 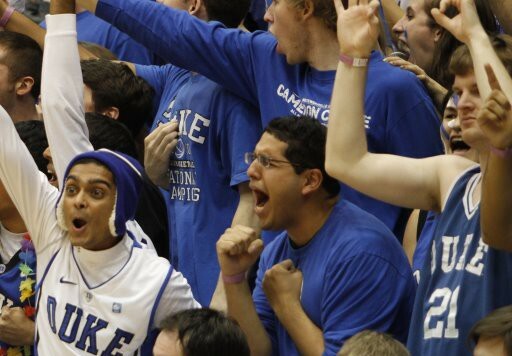 CT: Duke hasn’t been dominant in Cameron this season. Do the ‘Canes have what it takes to beat Duke on Sunday? Category 6: Absolutely. Miami has experience, talent, and an excellent coaching staff. Durand Scott comes in playing the best basketball of his career the last few games. That being said, “hasn’t been dominant” means what? Duke actually lost a game? LOL. We know Duke will come to play, especially at home, and Miami will need to play its best game of the year to pull off the big upset. Thanks to the guys at Category 6 for the Q&A! We sincerely hope that they lose tomorrow. Excited for this game. I’m a Cameron Crazie first (class of 2010!) BUT I’ve lived in Miami all my life (minus college) and have been a season ticket holder at UM for almost 10 years now and I have got to say – the Canes are looking WAAAAAY better this year than in recent years. Wednesday’s 2OT thriller against Maryland just speaks immensely to the talents of the team and the guidance of Coach L. Tomorrow should be good!